Thomas guided the Falcons to 11 wins and a fifth-placed finals berth this season, bettering last year�s effort when they missed the finals. The colts eliminated East Fremantle by 15 points last weekend to advance to the first semi-final against Peel on Sunday. Falcons midfielder Clint Hinchliffe was runner-up in the Jack Clarke Medal for the competition�s best player. 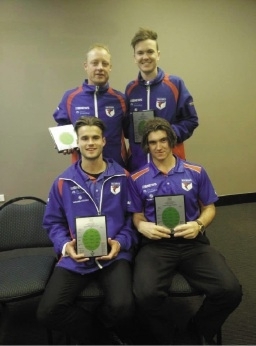 Hinchliffe was joined in the team of the year by West Perth teammates Josh Rotham and Mitch Antonio, pictured with Thomas.